A pack of raptors ready for you to purchase down in Woodland Hills! 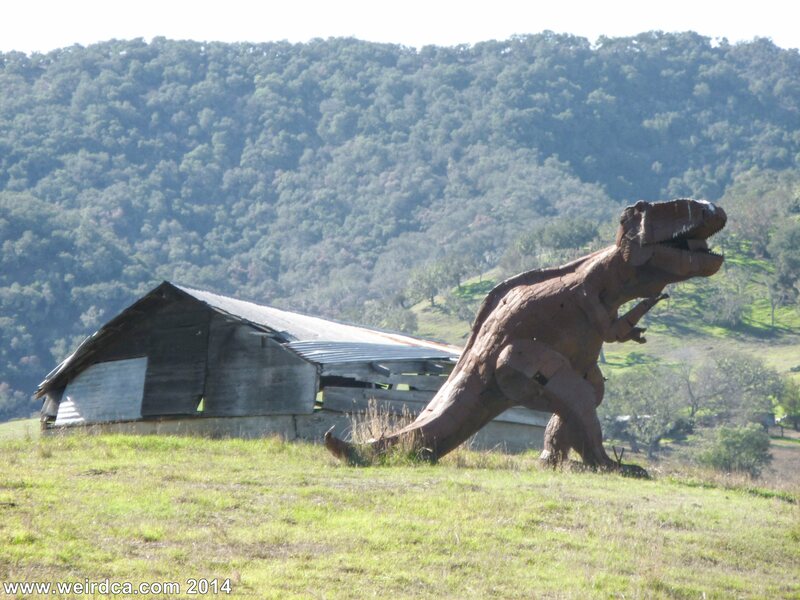 Dinosaurs still roam the hills and roads of California. Granted they're the metal kind, but at least they're not fully extinct yet. Sadly, they tend to come and go, moving around a lot. The most common species is the metal T-Rex, and he's often found alone, much like a real T-Rex. 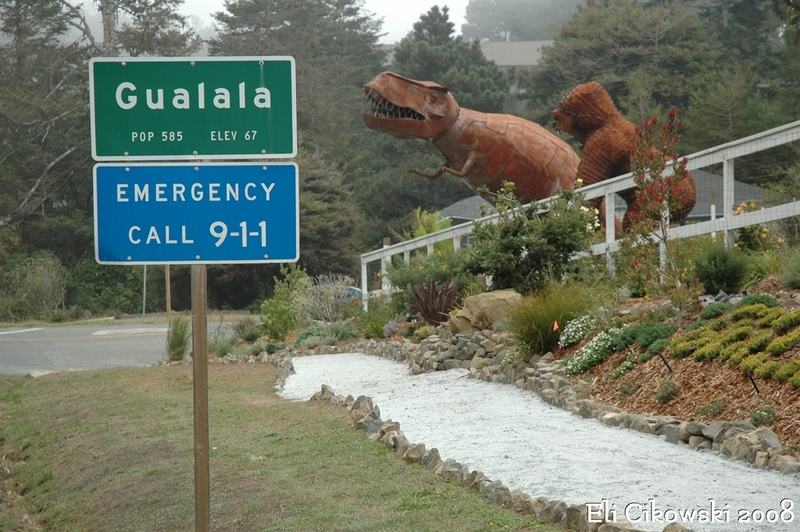 However, there are several high concentration areas of dinosaurs spread throughout California; areas where not one, not two, but often half a dozen or more dinosaurs band together to greet roadside travelers. Dinosaurs aren't the only animal to get in on the act. Mammoths, giant apes, giraffes, tapirs, deer, horses, and even a giant sea serpent all have gotten in on the metal sculpture craze and can often be found with their more common dinosaur friends. One of the more famous sets of metal dinosaurs is located at Peggy Sue's 50's Diner along interstate 15 near Yermo on the way to Las Vegas. Behind the diner is a dinosaur park, pun-fully called a "Diner-Saur Park" by the establishment, containing multiple dinosaurs and even a giant King Kong. Back in 1989, Santa Monica got their very own herd of dinosaurs, as they established six topiary dinosaur fountains along the Third Street Promenade. The six dinosaurs were designed by Claude and Francois-Xavier Lalanne and were a result of an art competition held by the city's Arts Commission. Initially some of the dinosaurs breathed fire at night, but that was put a stop to extremely quickly by Santa Monica's risk management group. Currently, as California is in a drought the six dinosaurs are no longer spitting water, as according to the city, despite using recycled water, even our Jurassic buddies need to pitch in and conserve water. This marks the first extended time the fountains have been turned off since they were installed. 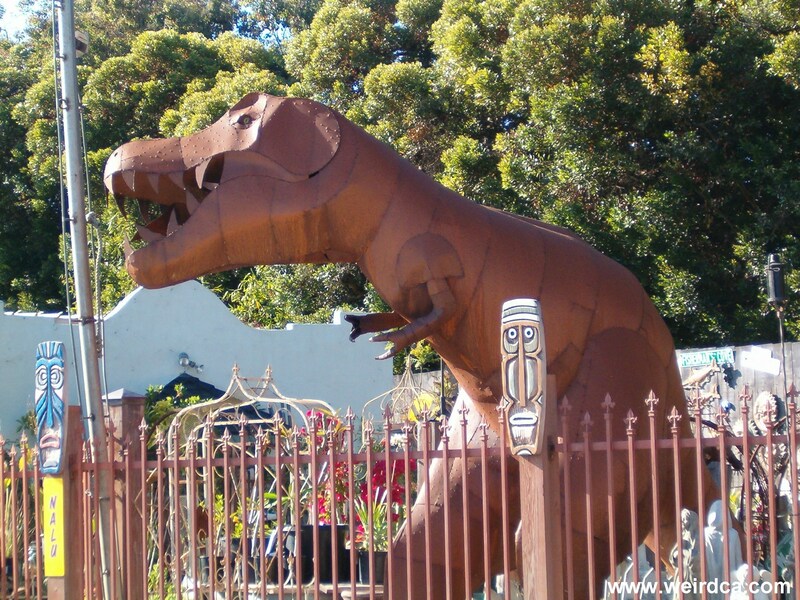 And East of Half Moon Bay along Highway 92 is Spanish Town, which is literally crawling with giant metal dinosaurs. 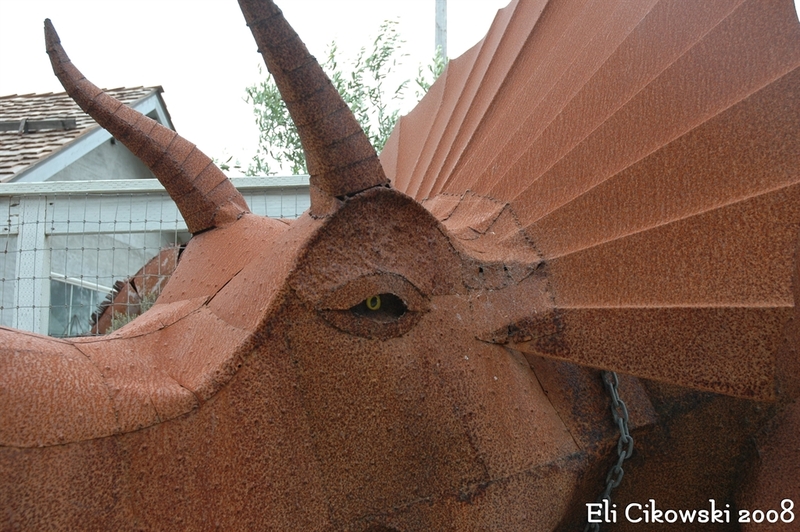 Spanish Town is filled with little shops, but outside there are metal dinosaurs and other creatures everywhere! T-Rex, Triceratops, a mammoth, and even a brontosaurus are just some of the dinosaurs on display there. Some pictures of the Half Moon Bay dinosaurs courtesy of Jandro Gamboa. Check out his Instagram account, Forgotten California, to see more pictures of abandoned and forgotten sites throughout California! 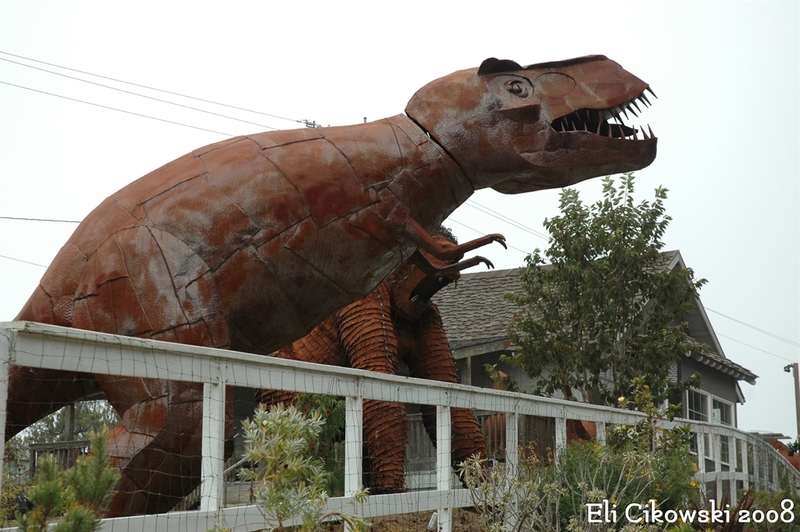 Jurupa Mountains Discovery Center has a full on Dinosaur Trail, complete with lots of metal dinosaurs! Plus, there are dinosaurs hidden throughout the grounds, a small museum, some fossils, and lots of other interesting and quirky things to see. Check out the full article for all the details! Luckily there are still dinosaurs in San Luis Obispo County. 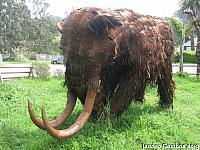 In Atascadero, a place along Highway 41 West has been invaded with the prehistoric beasts. 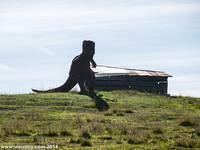 T-Rex, brontosaurus, triceratops, and other dinosaur species roam the hill before the house. The T-Rex is even eating a surfboard. To find the house, take Highway 101 to Atascadero and exit at Highway 41 West towards Morro Bay. About 2.5 miles down the road, on the left will be the house. 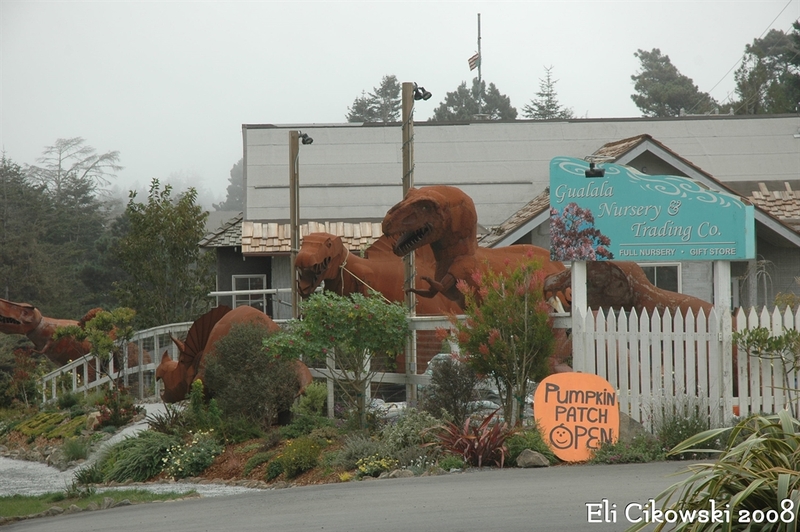 On Route 1 in Mendocino County in the small town of Gualala is the Gualala Nursery and Trading Company and it is filled with giant metal dinosaurs! 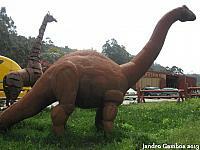 There are no less than five that can be seen from the road, plus additional dinosaurs inside the shop, as well as other metal non dinosaurs. But many other dinosaurs in San Luis Obispo County have sadly disappeared, going the way of their extinct brothers. 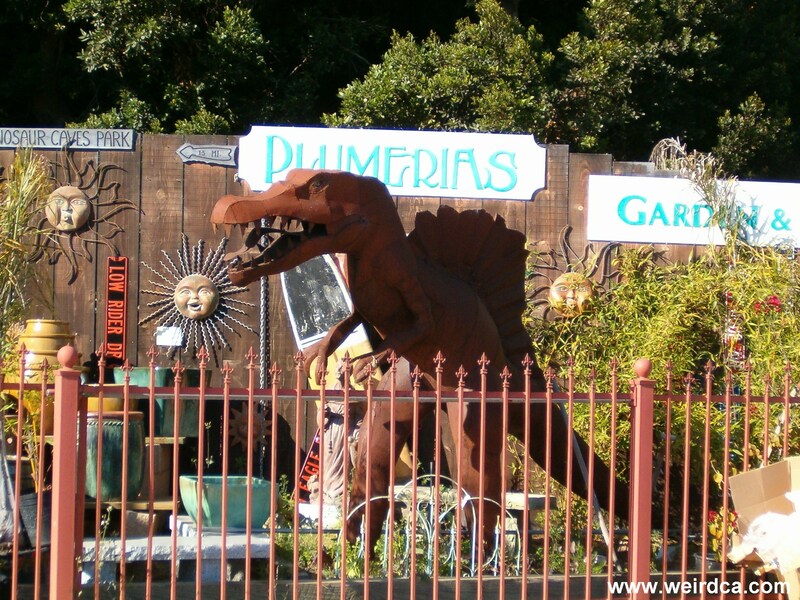 Oceano and Pismo Beach use to have several metal dinosaurs and other animals, mostly at a shop called Plumerias that was right next to one of the Giant Clams, but that was long ago. Luckily the business that has replaced Plumerias has some small metal dinosaurs at least keeping up the original spirit of the past business. 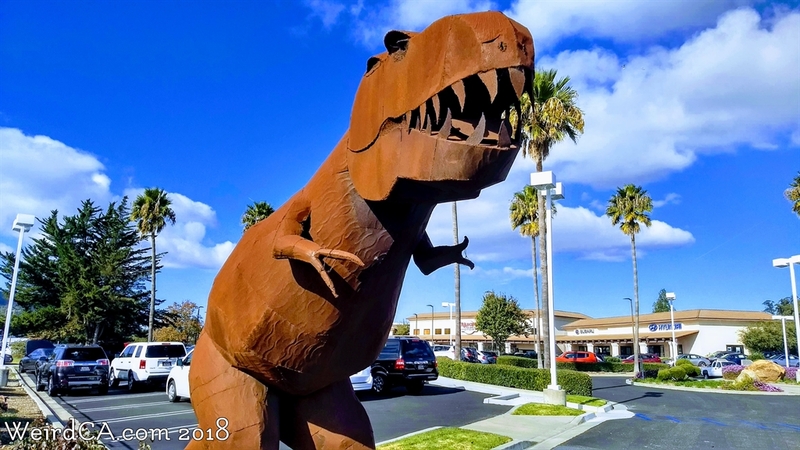 In Oceano, once at the corner of Front Street (Oceano's name for Route 1) and Paso Robles Street there existed a giant Tyrannosaurus Rex, a giraffe, some deer, an elephant and other metal animals, but sadly the location also went out of business. 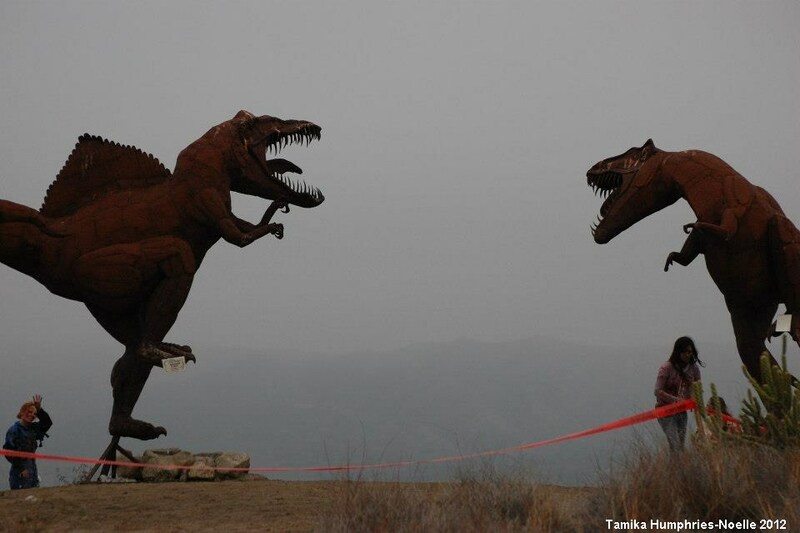 However, a few loner T-Rexs lie scattered around California. For example in the hills high above Pismo Beach lurks a tourist eating Tyrannosaurus Rex threatening those who drive by its house. He proudly wears a sign stating "I Love Tourists, They Taste Like Chicken". He also gets in the Christmas spirit, often wearing a Christmas hat, carrying a Christmas sack or as of 2018 a fistful of candy canes. Google's Headquarters in Mountain View has a T-Rex skeleton locked in mortal combat with a pack of pink lawn flamingos. A new T-Rex in Carmel is currently being disputed by some of its neighbors who resent the dinosaur moving into the neighborhood. 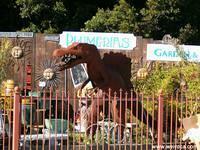 Pismo Beach T-Rex in the Christmas Spirit! 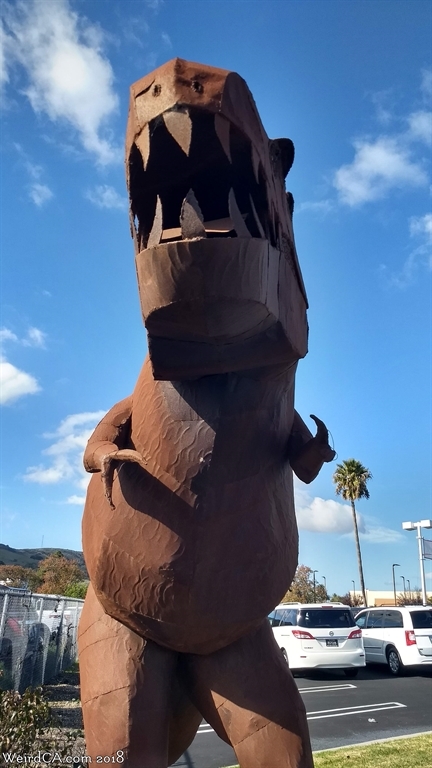 Another T-Rex guards a car dealership in San Luis Obispo off of Los Osos Valley Road, but disappeared temporarily in 2014. The dealership it stood outside was sold. Luckily sometime in 2017/2018, it returned along with a new dealership. It originally stood right on the street, over the sidewalk, but now is set back in the dealership parking lot on the right side. 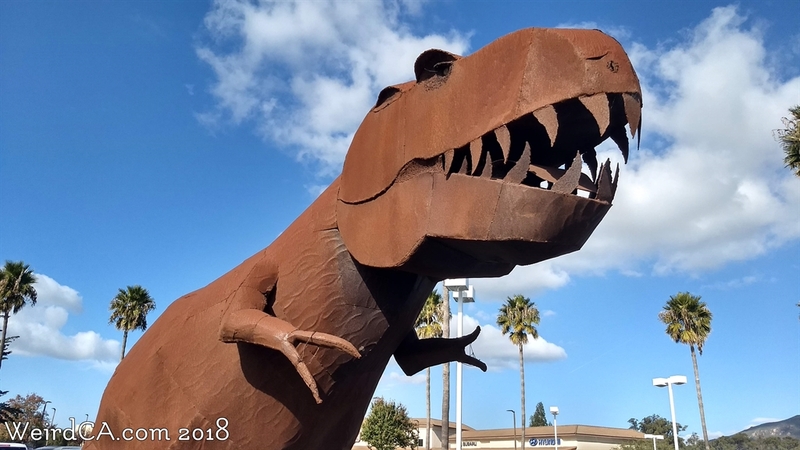 Sometime in the first half of 2018, the Shell Station in San Bruno on Highway 82, put up a large dinosaur roaring over its kill. Called "Battle of Tanforan" with a date of "95 Million BC" a large T-Rex stands over a slaughtered dinosaur with a sail on its back. The T-Rex comes complete with red painted bloody claws and red painted bloody toenails, along with a red tongue and white razor sharp teeth. Both dinosaurs have blue painted eyes. Both metal dinosaurs are similar to ones that can be seen in Spanish Town in Half Moon Bay, sans the colorful paint job. Located about 20 minutes due east of Arroyo Grande and Highway 101 is the small unincorporated community of Huasna. If you travel down some country roads for about 12 plus miles you'll come to the farming area where they grow fruits, vegetables, flowers, and herbs. 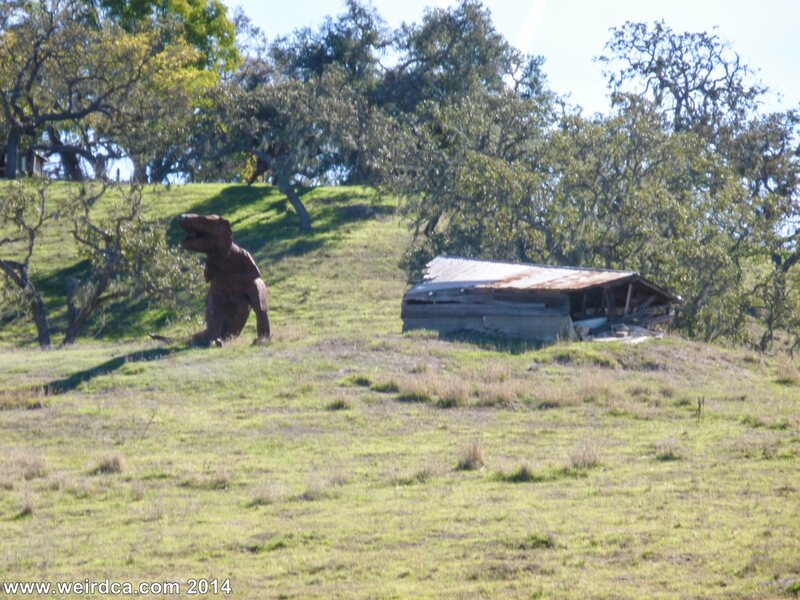 Located out in the middle of nowhere next to a dilapidated barn is one of the most picturesque T-Rex's to be found in California. 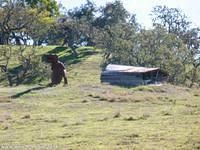 He stands in the middle of a field, surrounded by hills and trees, guarding his falling down barn. 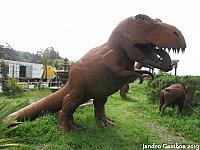 Perhaps the most famous of the loner T-Rexs is Dug the Dinosaur. Dug the Dinosaur not only stalks Redwood City, but dresses up for the holidays having appeared in costume for everything from Easter to Father's Day. He wears a Santa cap and chews on an animatronic Rudolph for Christmas and is apparently a San Francisco 49ers fan. At least two dinosaurs stand along Twenty Nine Palms Highway in Joshua Tree. Both carnivores, they stand outside a possibly former real estate office. There were no signs outside the office when I visited, so the real estate agency may no longer be there. The dinosaurs aren't in great shape, clearly starting to deteriorate. The one on the left had its jaw all screwed up, sadly. Rumor has it that there were two brontosaurus to the left of the carnivores, but, not only did I not check, there was a large bush in the way to where they should have been located. The brontosaurus set was a parent and a child, and was there at least as recently as 2015. At least the two fearsome carnivores remain, standing as sentinels on the east end of Joshua Tree, although they are in sorry shape. An old green frill headed dinosaur stands outside the office of the Queen's Motel in Victorville. He's been there awhile and appears to be made out of some sort of concrete or plaster. Although he could use a touch up, it could be argued that the motel which he stands outside of could use a bigger face lift. Charlie Browns in Littlerock on 138 (also known as the Pearblossom Highway) claims to be the largest gift shop in Antelope Valley. That being said they do have an impressive array of junk and other "memorabilia" to purchase, plus BBQ, snacks, beverages, sodas, shakes, jerky, etc. I particularly enjoyed the mini-doughnuts. The location started out as a fruit stand in 1929 and has been pulling in motorists on the Pearblossom Highway ever since. 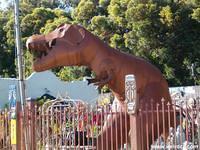 But the big appeal for us was the several dinosaurs on display. Although mostly behind fences, Charlie Browns has a dimetrodon, a stegasaurus, a styracosaurus, and a velociraptor. There are also horses, knights, lions, tigers, a small replica of the Eiffel Tower, and other quirky things. 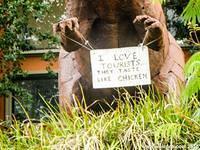 The velociraptor is in front of the business and makes for the best photo ops. Other suspected locations include California Nurseries in Northridge which has several dinosaurs and (formerly?) 29 Palms Highway in Joshua Tree, also sporting several dinosaurs. Galleta Meadows in Borrego Springs not only has several dinosaurs, but also metal mammoths, tapirs, sheep, sloths, birds, horses, and even a giant sea serpent! 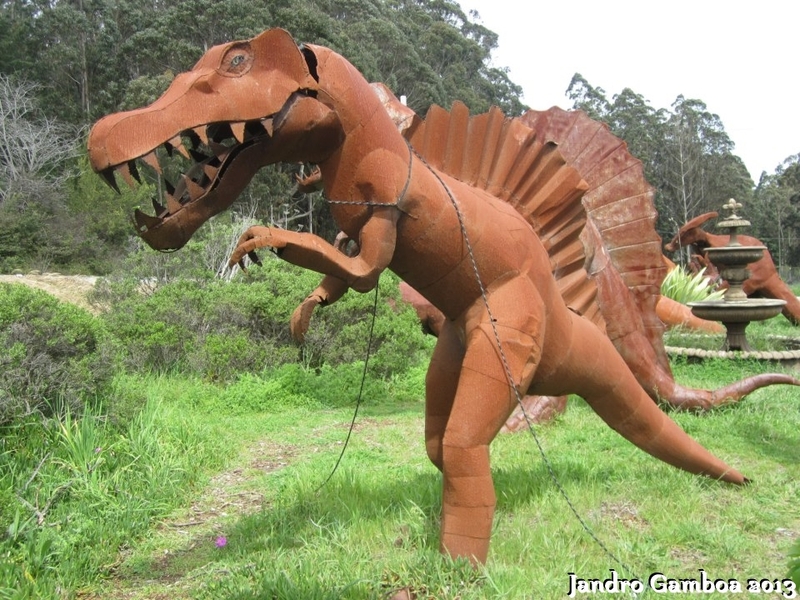 And in other areas east of San Diego, even more metal dinosaurs and creatures have been spotted! Google's main campus up the Bay Area has a T-Rex skeleton being swarmed by an angry flock of flamingos. 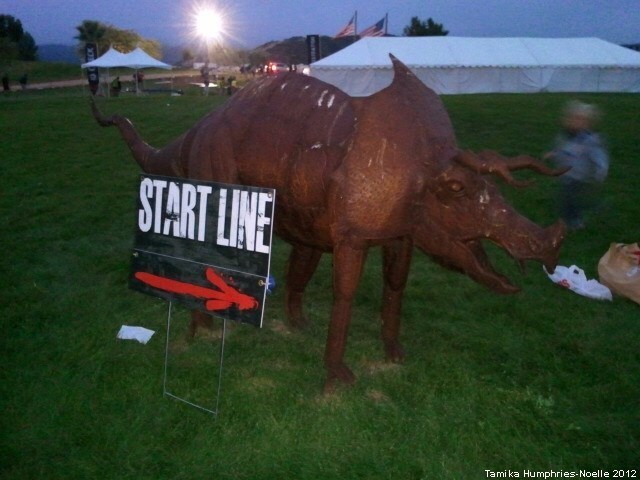 And additionally, a park east of Temecula, Vail Lake Resort, is crawling with some giant metal animals and dinosaurs. 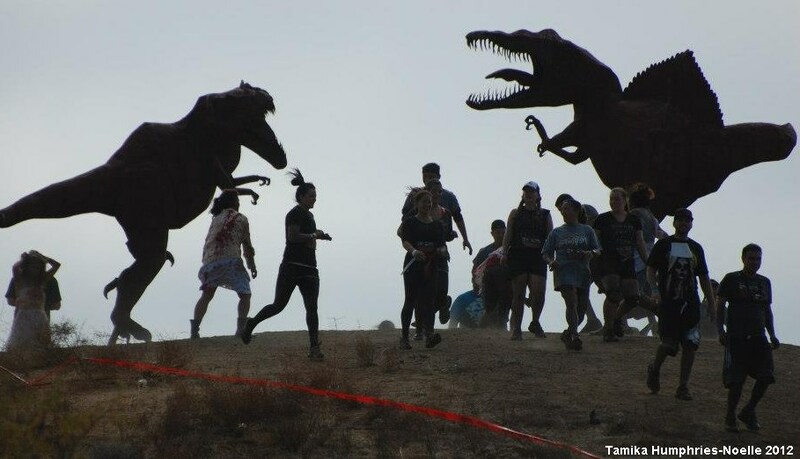 One of the events formerly held there was a zombie 5K race, which, led to some awesome pictures of zombies, dinosaurs, and racers trying to elude both. Sacramento also plays host to a strange dragon / dinosaur like skeleton. Located along Bradshaw Road, the skeleton is done up for Christmas complete with lights and Santa Claus hat. See picture below. 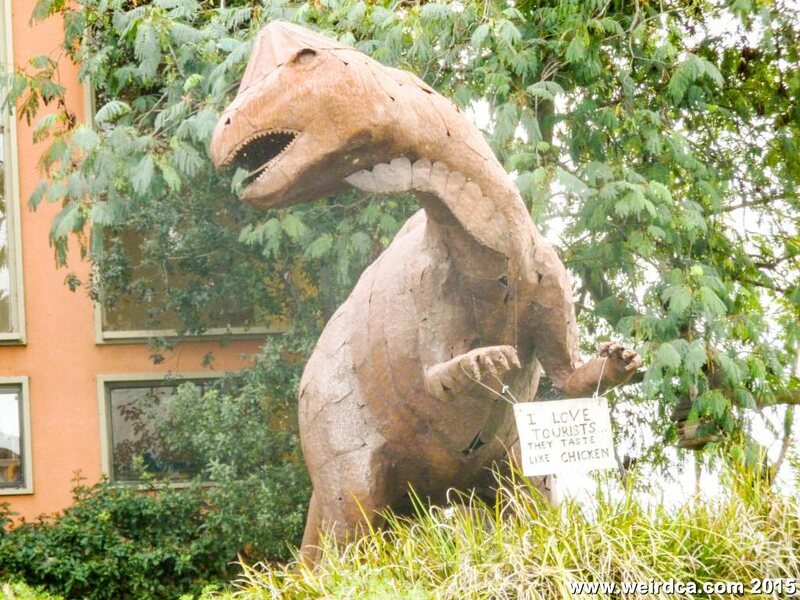 But California isn't the only state to have giant metal dinosaurs. 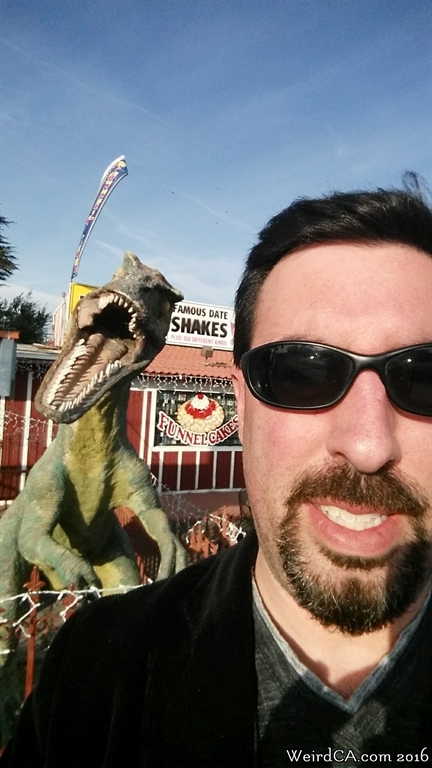 Gila Bend, Arizona showcases that classic battle between Triceratops and Tyrannosaurus Rex! 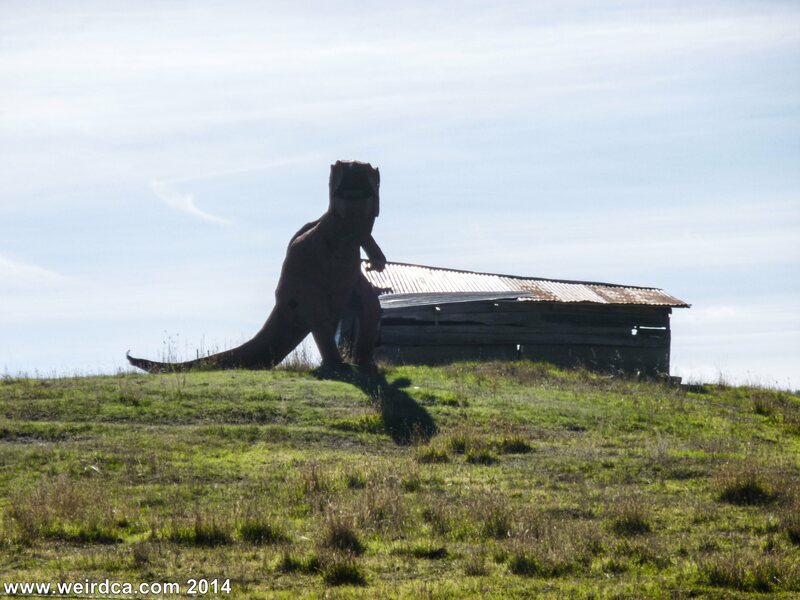 Giant metal dinosaurs and other long thought extinct metal animals still roam the countryside of California. If you run across any, please let us know! Special thanks to the following people for all the photos of giant metal dinosaurs that they have provided! Google's main office complex in Mountain View / Palo Alto has a dinosaur, plus pink flamingos which are also technically dinosaurs. if you are in san bernardino county on the 60 freeway near the glen avon area there is a big metal elephant perched high on the hillside. been there long as i can remember. also on the 10 in cabazon, ca there are the big dinosaurs, but i think they are concrete, you can go up inside one of them, (its officialy closed but very cool, and VERY unsafe lol and i think the other has a gift shop in it. There's also herds of strange, prehistoric metal creatures just north of Anza Borrego State Park, near Borrego Springs. There are dinosaurs, wild horses, giant sloths, turtles, and some strange flying critters. They were made by an artist who works in metal and got permission from the land owner to put up all these things. Yo do have to drive around a bit to see them, but it is well worth it. I was told they were all based on actual fossils found in the area. Oh yea, there are camels too.